Alejandro’s Mexican Grill was established in Downtown Roanoke at the Historic Roanoke City Market, by co-owners Moises and Lisa Nucamendi. 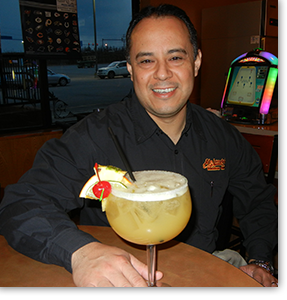 Their Salsa Bar, authentic California style Mexican Food, California Fusion Cuisine, and award-winning Margaritas have kept loyal Roanoke restaurant patrons coming back since November 2007. At a taqueria, you generally go in and order your food and pay at the counter. You’re given a cup to fill your own drink, and then you make your way to the salsa bar to grab your chips and salsa. 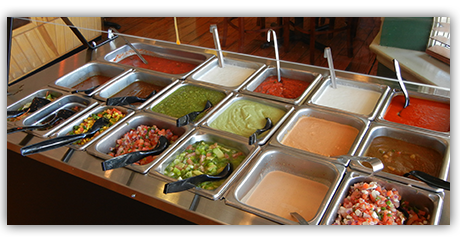 The salsa bar generally has a variety of salsas, maybe some sliced jalepenos/onions, lemon wedges, and anything else that the owners can think of. So, of course I was very excited to get one started here in Roanoke to satisfy my salsa tooth and rid myself of what I called my ‘taco withdrawals’! We first opened in downtown Roanoke on Campbell Avenue in November 2007. In December 2008, we were very excited to open a second location in the Hollins area, at the corner of Peters Creek and Williamson Road. We are family owned and family friendly. Make us your next dining experience – you will be glad that you did! Alejandro’s signature Salsa Bar items are created fresh daily and are included with every entree, along with unlimited chips. Many of our menu items are different than other places around Roanoke. Some of our more traditional or what we refer to as ‘real’ Mexican menu items are our Mexican tacos, Tortas, Chile Rellenos – made the traditional way with poblano chiles…, Mexican Sopes, Flautas and Mexican Enchiladas. Our dessert Flan is made in-house by our head cook and is just delicious! Additionally, most dishes can be made Vegetarian!